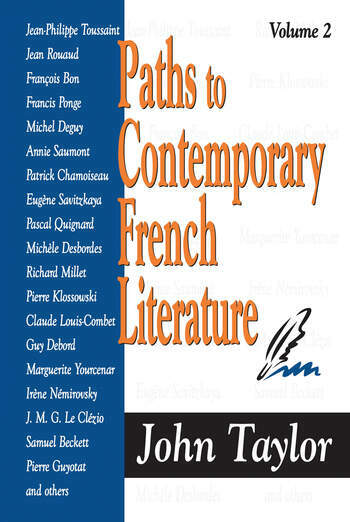 The first volume of Paths to Contemporary French Literature offered a critical panorama of over fifty French writers and poets. With this second volume, John Taylor�an American writer and critic who has lived in France for the past thirty years�continues this ambitious and critically acclaimed project. Praised for his independence, curiosity, intimate knowledge of European literature, and his sharp reader's eye, John Taylor is a writer-critic who is naturally skeptical of literary fashions, overnight reputations, and readymade academic categories. Charting the paths that have lead to the most serious and stimulating contemporary French writing, he casts light on several neglected postwar French authors, all the while highlighting genuine mentors and invigorating newcomers. Some names (Patrick Chamoiseau, Pascal Quignard, Jean-Philippe Toussaint, Jean Rouaud, Francis Ponge, Aime Cesaire, Marguerite Yourcenar, J. M. G. Le Clezio) may be familiar to the discriminating and inquisitive American reader, but their work is incisively re-evaluated here. The book also includes a moving remembrance of Nathalie Sarraute, and an evocation of the author's meetings with Julien Gracq Other writers in this second volume are equally deserving authors whose work is highly respected by their peers in France yet little known in English-speaking countries. Taylor's pioneering elucidations in this respect are particularly valuable. This second volume also examines a number of non-French, originally non-French-speaking writers (such as Gherasim Luca, Petr Kral, Armen Lubin, Venus Ghoura-Khata, Piotr Rawicz, as well as Samuel Beckett) who chose French as their literary idiom. Taylor is in a perfect position to understand their motivations, struggles, and goals. In a day and age when so little is known in English-speaking countries about foreign literature, and when so little is translated, the two volumes of Paths to Contemporary French Literature are absorbing guides for literary scholars, writers, poets, students of French culture, and readers of contemporary fiction and poetry. Part 5: The Quest for "Life"